I have toyed with natural red coloring lately. But I wanted to try it differently, in most cases you see bakers using puree beets or beet juice that has been reduced. Why not try out organic beet powder? I had a bag of it in my Trail Cooking supplies that I had not cracked open…..so today I tried out a couple recipes using it as a natural dye. I am happy with the results overall, the color is how I like it and easily controlled. Unlike using artificial red coloring it doesn’t stain your hands or your counter. Do be careful with clothing though! 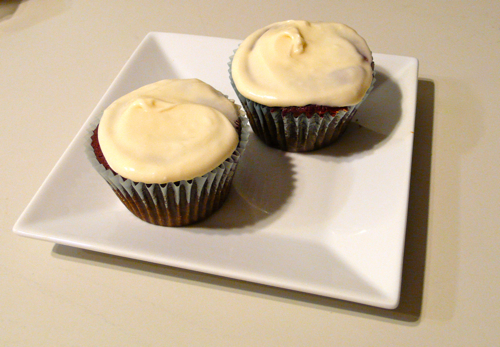 For the first testing I did a version of the red velvet cupcake. 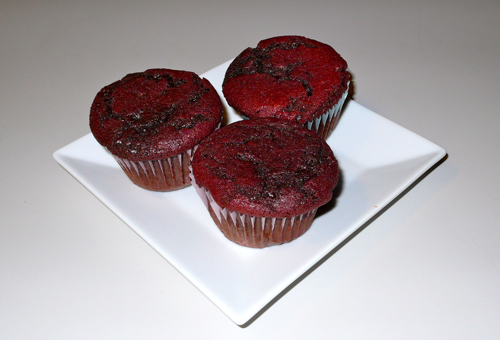 Most red velvets call for ungodly amounts of artificial coloring (2 to 3 Tablespoons!) leaving the cupcake teeth staining fire engine red. No one needs that do they? Maybe some people enjoy it but I don’t (and for me it would be migraine inducing). The cupcakes come out with a nice hue to them, red but not stop sign red. Do make sure you use regular cocoa powder and not dutch processed, it will mess with the color. Heat your oven to 350°. Line two 12 cup cupcake trays with paper liners and set aside. In a large bowl combine the flour (stir up the flour and use a spoon to scoop into the measuring cup), cocoa powder, beet powder and salt. Sift together to remove any clumps and set aside. In a stand mixer bowl add the butter and sugar, cream till light and fluffy. Add the eggs, buttermilk and vanilla, beating in till mixed. Quickly beat in the baking soda and vinegar. Add in the dry ingredients and let beat till mixed in. Divide the dough between the prepared pans. Bake for 18 minutes, check with a toothpick for being done. You may need to bake as long as 25 minutes depending on your oven. Let cool on wire racks. Frost with cream cheese frosting (whatever type or recipe you prefer).